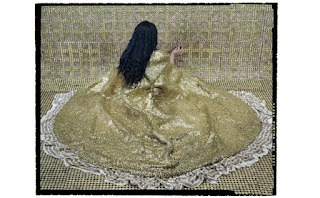 ✦ Work by the remarkable emerging photographer Khadija Saye, who died, age 24, this June in London's horrific Grenfell Tower fire, are on view through November 26 in the Diaspora Pavilion at this year's Venice Biennale. A print of one of Saye's wet collodian tintypes can be seen at Tate Britain in a tribute to the fire's victims. See a selection of Saye's photographs. ✦ Coming in October: Tina Modotti: Photographer & Revolutionary | Between Politics and Form: The Life and Work of Tina Modotti by Margaret Hooks. The book was first published in 1993 and until now has been out of print. 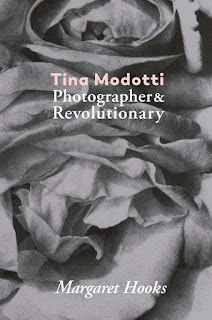 A definitive portrayal of the artist, the 288-page book with 130 black-and-white images includes archival material, interviews with Modotti's contemporaries, and rare photographs. ✦ Watch Danny Quirk as he creates body anatomy art. ✦ Make your own colorwheel. ✦ A new discovery for me and an artist to watch: painter and sculptor Grace Tan, who recently showed new work in "Through the Eyes of Agape", a series of figurative charcoal drawings inspired by the story of Hagar in Genesis, at Lookout Gallery in Vancouver. View a selection of Tan's work in her online gallery. Günther Uecker Interview: Poetry Made with a Hammer from Louisiana Channel on Vimeo. 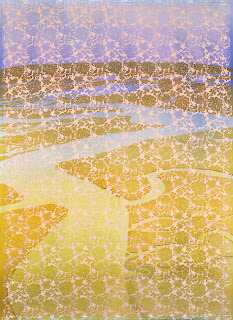 ✭ South Carolina artist Mary Edna Fraser presents her gorgeous narrative landscapes in "Rising Tides", a solo exhibition beginning July 5 at Joan Hisaoka Healing Arts Gallery at Smith Center, Washington, D.C. To continue through August 26, the show features Fraser's aerial views of Earth that she has transcribed onto silk using dyes and the medium of batik. The landscapes, which are gorgeous, document regions of the world threatened by climate change. See Fraser's galleries of batiks, monotypes, and oils on her Website. Batik on Silk Lace, 76" x 54"
Read Stephanie Hunt's article "Force of Nature" (May 2017) in Charleston magazine. If you love Fraser's work but cannot afford her originals, take a look at her beautiful silk scarves and silk rugs; giclees on paper, limited to 100 prints, also are available. 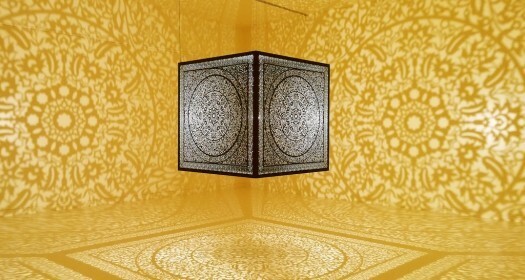 ✭ Continuing through December 3 at Peabody Essex Museum, Salem, Massachusetts, is "All the Flowers Are for Me", an immersive installation by cross-disciplinary artist Anila Quayyum Agha that features floral forms inspired by Persian and Turkish architecture, textiles, and miniature paintings. Read Susan Flynn's post, "Seeing the World in a New Light" (October 2016), at Connected, PEM's blog. ✭ Santa Fe's New Mexico Museum of Art has placed on view work from its collection that examines how New Mexico artists have imagined and reimagined the state. Continuing through September 17, "Imagining New Mexico" considers the artists' responses to land, traditions, and histories as they relate to the state's identity. 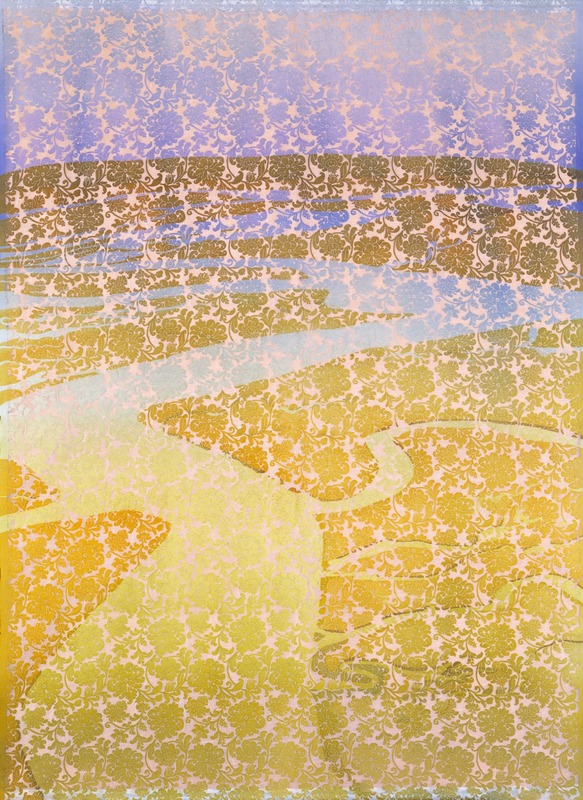 Among the artists represented in the show are Gustave Baumann, Helen Cordero, Laura Gilpin, Peter Hurd, William Lumpkins, Maria Martinez, Georgia O'Keeffe, and Fritz Scholder. 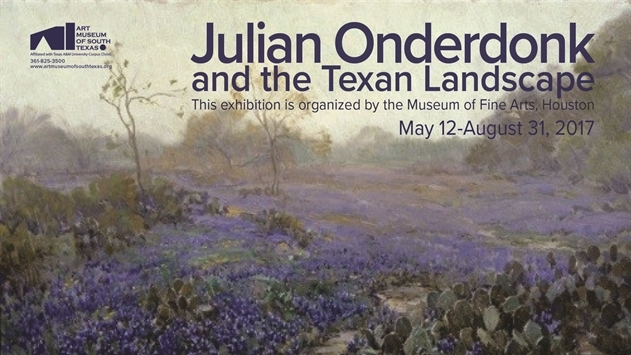 ✭ Thirty masterful landscape paintings by Texan Julian Onderdonk (1882-1922) can be seen in "Julian Onderdonk and the Texan Landscape", continuing through August 31 at the Art Museum of South Texas, which is affiliated with Texas A&M University at Corpus Christi. Images can be seen at the exhibition link. Works in the show have been loaned by museums and private collectors. 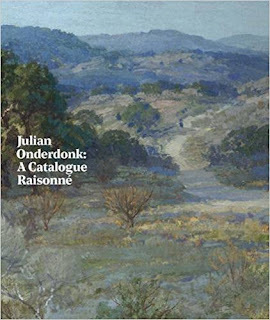 Accompanying the exhibition, which already has been to the Museum of Fine Arts, Houston, and San Antonio Museum of Art, is Julian Onderdonk: A Catalogue Raisonne (Museum of Fine Arts Houston/Yale University Press, October 2016) by Harry Halff and Elizabeth Halff. ✭ The "Other People's Pictures" exhibition at Frances Lehman Loeb Art Center at Vassar College, Poughkeepsie, New York, opens July 14. 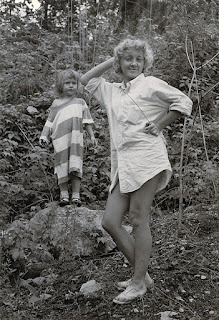 The show, intended to examine how snapshots were used by amateur photographers, presents (through September 17) 200 small black-and-white vernacular photographs from the early- and mid-20th Century, primarily images of American women, all gifts to the center by collector Peter J. Cohen. Today, Thursday's Three introduces you, via video interviews, to three artists: Sophia Dawson, Tatyana Fazlalizadeh, and Vaimoana, each of whom explores through and is dedicated to using her art to heighten awareness of social issues. All three are worthy of greater recognition. ✭ Sophia Dawson (aka "Wet Paint") of Brooklyn, New York, uses art to tell the stories of people seeking to overcome the barriers and other injustices they face. ✭ Tatyana Fazlalizadeh is a painter, muralist, and illustrator who addresses in her street art social issues such as racism and sexism. Her recently exhibited project Not Going Anywhere, a series of wheatpasted portraits of American artists and activists, aims to challenge post-election misogyny and xenophobia. Another of her projects, Stop Telling Women to Smile, concerned with street harassment, was exhibited in the city streets of Brooklyn, Chicago, Atlanta, Paris, and Mexico City. Be sure to take a look at Fazlalizadeh's recent portraits in oil on canvas. Fazlalizadeh is a 2015 "Forbes 30 Under 30" recipient. ✭ Tongan Vaimoana, who was among more than 40 artists and scholars who in 2016 participated in the Smithsonian Asian Pacific American Center's "Crosslines: A Culture Lab of Intersectionality", describes herself as a community muralist. Her Sunset Park, Brooklyn, project We Come From the Future, featuring women, women of color, indigenous women, and immigrant women examined women's relationships, especially those of mothers, grandmothers, and daughters, by celebrating their voices and sharing their often-too-invisible stories. The project came about when, in 2014, Vaimoana received a grant to produce a mural for the community-based nonprofit organization Turning Point, which offers free housing, health, and social services programs to the community. Vaimoana completed her project in 2015. Vaimoana also is a poet, writer, actor, playwright, filmmaker, and educator. For more than a decade, designer Margrethe Odgaard of Denmark has used color diaries to "see more specifically" — to document her environment and its surroundings and objects so that she can remain "open [to] a new dimension inside as well as outside" herself. Below, in a brief video interview with Louisiana Channel, Odgaard explains what she does, how, and why. She was interviewed at her studio in Copenhagen in February 2016. Winner in 2016 of the Torsten och Wanja Soderbergs Prize, a prestigious design award, Odgaard is part of Included Middle, which she co-founded with furniture designer Chris L. Halstrom. In the past, she has collaborated with a number of famous brands, including Georg Jensen. She was educated at the Royal Danish Academy of Fine Arts, School of Design, and worked as a printing assistant at The Fabric Workshop and Museum, Philadelphia, and as a textile designer for EPICE, a French fashion company. Currently, Odgaard is enjoying through August 27 an exhibition at Designmuseo, Helsinki, Finland. From award-winning filmmaker Kate Jessop, the mixed-media, 2D animation Dear Domenico presents a poetic letter from Stefano Gabanna to Domenico Dolce. The letter relates the breakup of the Gabanna-Dolce relationship and their fashion label's evolution. Commissioned by Festival delle Lettere (Milan), the film uses stop-motion, fabric collage, and digital drawing. Jessop is a co-founder of Girls on Film. Dear Domenico - English subtitles from Kate Jessop on Vimeo. See more of Jessop's promotional, narrative, and non-narrative films. This year marks the centennial of the birth of the highly influential poet Gwendolyn Brooks (June 7, 1917 - December 3, 2000). Adding to the many other forms of recognition of the centennial is the charming video below, produced by the Poetry Foundation. From Manual Cinema in association with Crescendo Literary, the video uses paper-cut puppetry to imagine what inspired Brooks to write her famous poem "We Real Cool". The story is by Eve Ewing and Nate Marshall and the music by Jamila Woods and Ayanna Woods; the director is Drew Dir of Manual Cinema. Commissioned by the Poetry Foundation for the centenary is a live, staged production of No Blue Memories: The Life of Gwendolyn Brooks, by Eve L. Ewing and Nate Marshall; it premieres this November. please don't leave traces behind. Read "Twilight" from Empty Chairs. Note: Liu Xiaobo was released from prison on June 26, 2017. Read "Chinese Nobel Peace Laureate Liu Xiaobo Released from Prison, Suffering from Liver Cancer", The Washington Post, June 26, 2017. Today's short introduces the Bridge Theatre, a new performance art space opening this fall in London, next to Tower Bridge. The theatre of 900 seats will debut with Young Marx (October 18 - December 31) and, through the winter and spring, plans to present Julius Caesar (January 20 - April 15, 2018) and Nightfall (April 28 - June 3, 2018). Memberships are available. ✦ Word is out that the Renwick Gallery, part of the Smithsonian American Art Museum and scene of the immensely popular 2015-2016 "Wonder" show, plans "the first ever major exhibition" of monumental art installations created for Burning Man in Black Rock City, Nevada. The exhibition, titled "No Spectators: The Art of Burning Man", will open March 30, 2018, and conclude September 16, 2018. Read the details in the gallery's exhibition announcement. ✦ If your artistic tastes run to desert landscapes, cloudscapes, and desert blooms and flowers, take a look at Doug West's paintings at Blue Rain Gallery (Santa Fe, New Mexico), Leslie Levy Fine Art (Scottsdale, Arizona), and Ro Gallery (Long Island City, New York). West has had scores of solo shows and his collectors number in the thousands. ✦ Artist Martin Roth created in mid-town Manhattan in May 2017 an urban garden "nurtured by tweets", specifically, the tweets of the president of the United States. See "I cultivated a piece of land...." and read Claire Voon's Hyperallergic article "A Field of Lavender Nourished by Trump's Tweets". ✦ A filmmaker you've probably never heard of but should learn about: Alice Guy-Blache. 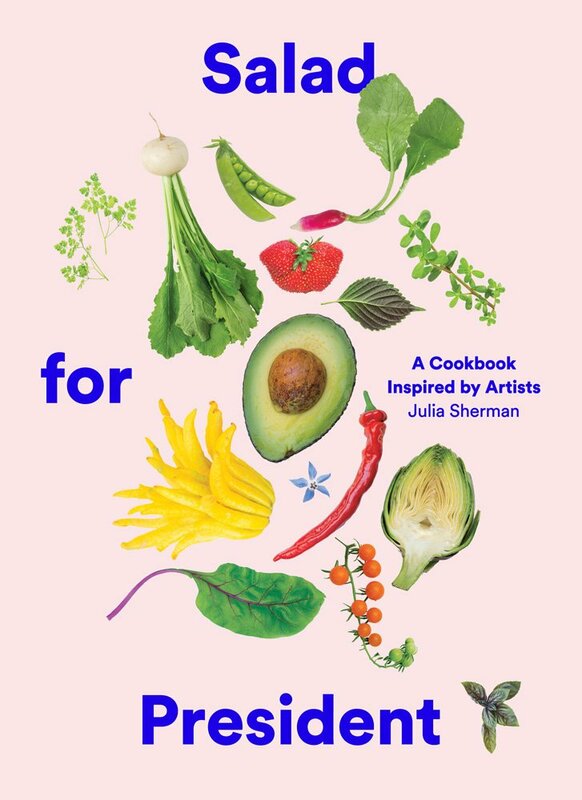 ✦ If you're a fan of salads, Salad for President: A Cookbook Inspired by Artists, by Julia Sherman, will visually enrich your life even before you choose a recipe. 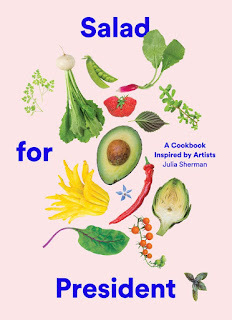 Julia Sherman is both an artist and a cook who writes at the blog Salad for President. The book is on tour. ✦ Here's a behind-the-scenes look at Gary, Indiana's project "ArtHouse: A Social Kitchen". Opening this fall, the cultural center for culinary and visual art will feature public art and spaces for community gatherings. Funded by Bloomberg Philanthropies and the John S. and James L. Knight Foundation, it will provide local residents and new businesses with access to a commercial training kitchen, feature a pop-up cafe as well as gallery and exhibition spaces, and promote dinners in Gary residents' homes and at the cafe. Chicago-based Theaster Gates is the artistic director. ✦ Immediately below is the trailer for Yarn (2016), directed by Una Lorenzen with co-directors and producers Heather Millard and Thordur Jonsson. The movie, which can be seen in its entirety on Netflix, introduces artists engaged in innovative knitting and crocheting. ✭ Continuing through September 10 at the Hirshhorn Museum is "Markus Lupertz: Threads of History". Concentrated on the pioneering early works of the German artist, from 1962 to 1975, the exhibition presents for the first time in the United States Lupertz's 40-foot-long West Wall (Siegfried Line) and more than 30 other paintings reflecting the artist's exploration of abstract expressionism, Pop art, and German postwar culture. The Hirshhorn exhibition coincides with a complementary exhibition at The Philipps Collection, "Markus Lupertz", which spans the neo-expressionist painter's entire career, from the 1960s to today; the show continues through September 3. The Phillips show features the 1982 painting The Large Spoon. A catalogue jointly produced by the museums and including new scholarship is available. The two exhibitions, which together feature almost 100 works, mark the museums' first formal collaboration. ✭ At the National Museum for Women in the Arts, which is celebrating its 30th anniversary, you'll find "Revival", featuring work by contemporary sculptors and photo-based artists, including Louise Bourgeois, Petah Coyne, Lalla Essaydi, Polly Morgan, Alison Saar, Beverly Semmes, and Joana Vasconcelos. Media include video projections, large-scale images, hanging sculptures, and work composed of hair, yarn, velvet, marble, wax, brambles, or taxidermy birds. The exhibition continues through September 10. ✭ The summer exhibitions at Katzen Arts Center at American University Museum opened June 17. Among them are a retrospective of the paintings of Val Lewton, "Val Lewton: From Hollywood to Breezewood"; and "Frederic Kellogg: Works in Oil and Watercolor", a selection of landscapes featuring both watercolors and paintings in oil on canvas. Each show is on view through August 13. 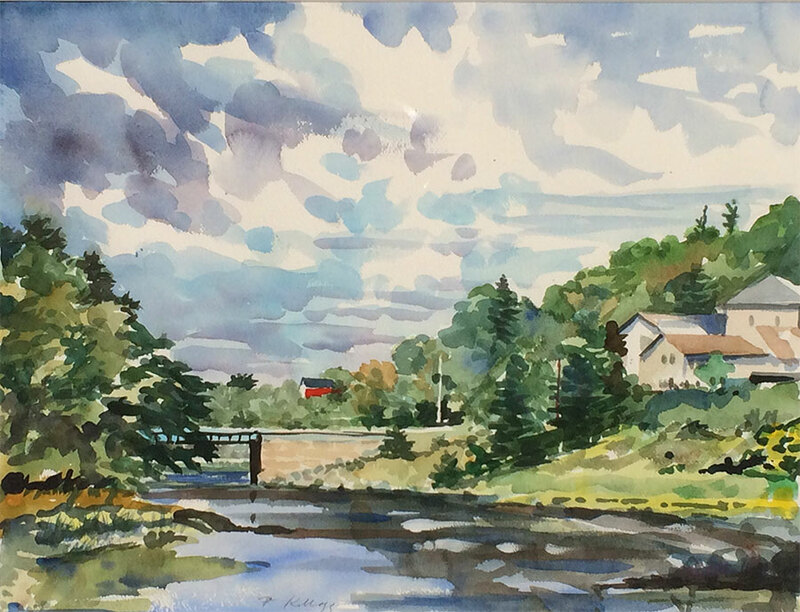 Kellogg will demonstrate watercolor painting en plein air tomorrow, June 24, 2:00 p.m., in "Painting with Frederic Kellogg". 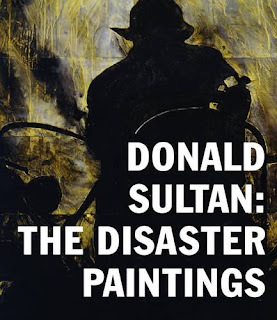 A gallery talk on the Val Lewton exhibition is scheduled for July 13, 6:30 p.m.
✭ Donald Sultan's industrial landscape series, the Disaster Paintings, continues on view through September 4 at the Smithsonian's American Art Museum. Work in the exhibition, "Donald Sultan: The Disaster Paintings", is composed with industrial materials such as tar and Masonite tiles and based on events Sultan read about in his daily newspaper. The show comprises 12 paintings dating from 1984 to 1990, including Plant, May 29, 1985, from the collection of the Hirshhorn Museum. Organized by Ft. Worth's Modern Art Museum, the show will open at two other museums, North Carolina Museum of Art, Raleigh (September 23 - December 31), and Sheldon Museum of Art, Lincoln, Nebraska (January 24 - May 13, 2018), upon its conclusion in Washington, which was the third stop of a five-city national tour. 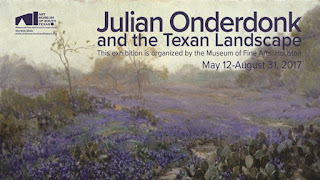 It already has appeared at Modern Art Museum, Ft. Worth, and Lowe Art Museum, Miami. A catalogue is available (see image below). 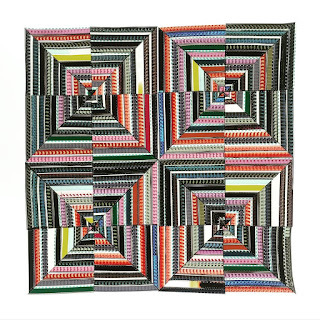 ✭ The exhibition "Connections: Contemporary Craft at the Renwick Gallery" is ongoing. The show at the Renwick, part of the Smithsonian American Art Gallery, places on display more than 80 objects that celebrate craft as a discipline and approach to how life is lived. All of the objects are from the gallery's permanent collection and include new acquisitions, among them: John Grade's Shoal (Bone Shoal Sonance), Judith Schaechter's The Birth of Eve, Marie Watt's Edson's Flag, and Akio Takamori's Woman and Child, all of which are being presented for the first time. Also on view is work by metalsmith Jennifer Crupi. The connections the artworks make are both explicit and subtle. Today, Thursday's Three spotlights a trio of recently published or forthcoming collections of poetry. 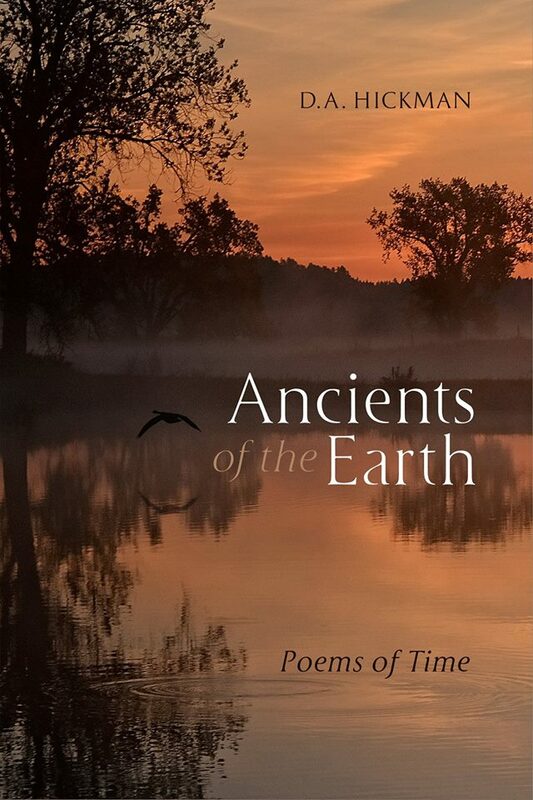 ✭ Ancients of the Earth: Poems of Time (Capturing Morning Press, Summer 2017) by D.A. 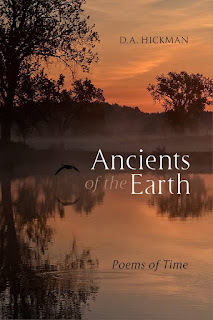 Hickman ~ Hickman's first book of poetry, Ancients of the Earth "explores our shared human destiny via the constraints and luxuries of time." Hickman has published two nonfiction books: The Silence of Morning: A Memoir of Time Undone (Capturing Morning Press, 2015) and Always Returning: The Wisdom of Place (Capturing Morning Press, 2014). The cover image ("Sunrise Goose") is by John 'Fiskr' Larsen and the design by Michele DeFilippo of 1106 Design, Phoenix, Arizona. ✭ Lighthouse for the Drowning (BOA Editions, June 2017) by Jawdat Fakhreddine ~ Translated by Huda Fakhreddine and Jayson Iwen, this bilingual collection is the first full-length collection of the Lebanese poet's works to be published in the United States. A resident of Beirut, Fakhreddine is a professor of Arabic literature and criticism at Lebanese University and publishes articles and poems in al-Hayat and al-Khaleej newspapers. 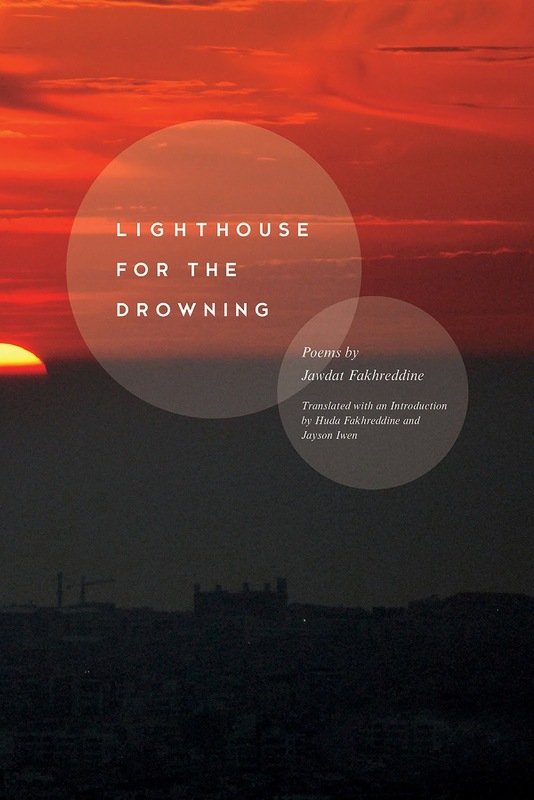 His other poetry collections include Rural Illusion, A Beacon for the Drowning, and Skies. 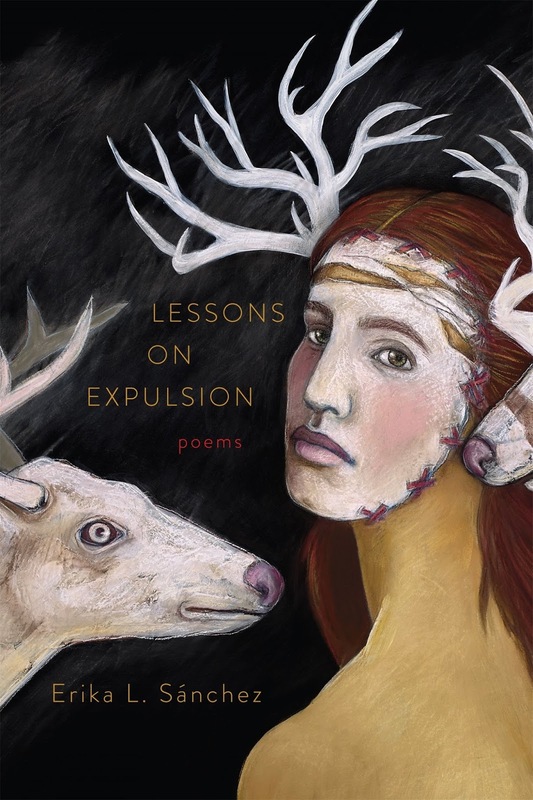 ✭ Lessons on Expulsion: Poems (Graywolf Press, July 11, 2017) by Erika L. Sanchez ~ Sanchez's debut poetry collection captures the social, cultural, economic, and linguistic borders confronting her as the daughter of undocumented Mexican immigrants. Winner of a "Discovery" poetry prize from the Boston Review and a Dorothy Sargent Rosenberg Poetry Fellowship, Sanchez, of Chicago, Illinois, is also an essayist and novelist. Her book for teens and young adults, I Am Not Your Perfect Mexican Daughter (PenguinRandom House), is forthcoming. picture is an unpredictable movement. From December 2016 to May 2017, Danish painter Tal R* allowed the Louisiana Channel to interview him while he was at work on a series of nine railcar paintings he titled Habakuk (2017). Throughout the filmed conversation, embedded below, Tal R discusses his background and work, and how his paintings address the subject of time — past, present, and future. He also talks about his career as an artist, how "as an artist, you have to be as mystified as the observer." Born in 1967 in Tel Aviv, Israel, Tal R and his family migrated to Denmark when the artist was a child. He currently lives and works in Copenhagen. Credited with helping to "bring painting back" following conceptual art's dominance of the 1990s, he exhibits throughout the world. In the United States, "Tal R: Keyhole", at New York City's Cheim & Read Gallery, ran from January 5 through February 11, 2017. 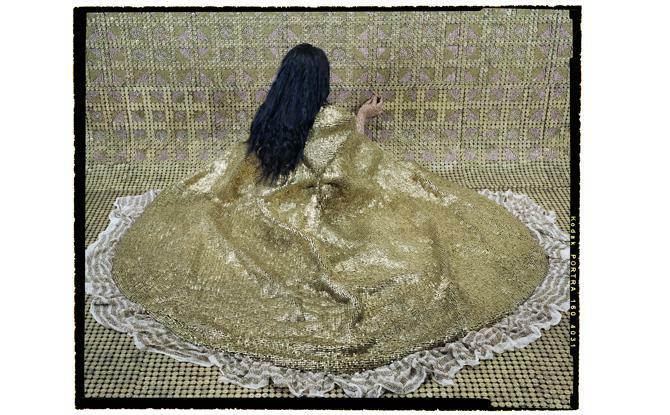 Overseas, his exhibition at the Louisiana Museum of Modern Art, "Academy of Tal R", continues through September 10. * Tal R's full name is Tal Shlomo Rosenzweig. Read Jennifer Samet's interview, "Beer with a Painter: Tal R" at Hyperallergic (February 4, 2017). I have shown before some of the collaborative work of spoken word poet, novelist, and filmmaker Lucy English. (See the March 2, 2017, post "Thursday's Three on Poetry".) Today presents another opportunity to feature English's collaboration with filmmaker Marie Craven, The Last Days. The videopoem recently was added to English's poetry-film collaboration project "The Book of Hours". Lucy English both wrote and narrates the poem. Images are from the Prelinger Archives. The music is by Kevin MacLeod. The Last Days from Marie Craven on Vimeo. If you are unfamiliar with writer and lecturer Rachel Zucker's interviews with poets and other artists, you've been missing some excellent conversations. 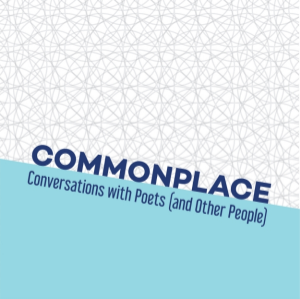 Browse here for just a few of Zucker's podcasts at Commonplace: Conversations with Poets (and Other People). Visitors to the site can listen to the interviews and also download them. Zucker has posted interviews with such poets as Jericho Brown, Steph Burt, Julie Carr, Natalie Diaz, Rita Dove, Nick Flynn, Ross Gay, Terrance Hayes, Bernadette Mayer, Alice Notley, Alicia Ostriker, Morgan Parker, Molly Peacock, D.A. Powell, Kristin Prevallet, Claudia Rankine, Roger Reeves, and David Trinidad. Among the "other people" with whom Zucker has posted interviews are multimedia artist Wayne Koestenbaum, author Olena Kalytiak Davis, and writer and illustrator Andi Zeisler. Zucker posts for each podcast a summary of the content of her interview, as well as "extra resources", which range from linked titles of the interviewee's books, to a list of links to other writers and books mentioned in each episode, to related links (e.g., essays, criticism, publishers, scholarship, other interviews found online). — it's about what you can give to the world. . .
to give back to the world in some significant way. Today's short is the trailer for Leonie (Monterey Media, 2013), directed by Hisako Matsui. The film relates the story of Leonie Gilmour, whose son was the sculptor Isamu Noguchi (1904-1988). ✦ For her installation Portraits of Exile, Shimon Attie submerged for six weeks underwater in Copenhagan's Borsgraven canal nine large light boxes mounted with transparency images, evoking both the 1943 Danish rescue of Jews and Denmark's far more opaque response to contemporary refugees. Attie, currently exhibiting in the St. Louis Art Museum's New Media Series, where her film The Crossing can be seen through June 25, creates not only site-specific installations for public spaces but also produces video installations and new-media works that examine relationships between place, memory, and identity. See more of Attie's work. 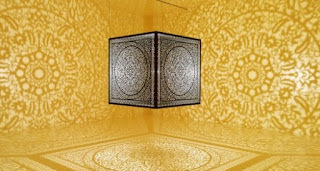 Portraits of Exile from Shimon Attie on Vimeo. ✦ A digital archive of Corita Kent's preparatory materials such as sketchbooks, completed screenprints, a biography, scholarly essays, and other resources has been established at the UCLA's Hammer Museum. Read "Corita Kent in the Grunwald Center Collection". Kent's personal art collection of more than 1,400 objects went to the center on the artist's death in 1986. ✦ Some 20 tons of recycled newspaper went into David Mach's creation of a tsunami wave. Watch Katie Spencer's video reportage on the installation, "David Mach's New Installation Uses Tonnes of Old Newspapers", at Sky News (May 2017). ✦ A full-time neuroscience researcher, Ted Asher, has been appointed by the Peabody Essex Museum, Salem, Massachusetts. Read "PEM Appoints Dr. Ted Asher as First-Ever Neuroscience Researcher at an Art Museum" (May 8, 2017). Also read Stav Ziv, "Art and the Brain: Museum Near Boston Hires Neuroscientist to Transform Visitors' Experience", Newsweek, May 17, 2017. ✦ Inspired by Dante's Inferno, Robert Rauschenberg (1925-2008) created between 1958 and 1960 a series of 34 drawings, XXXIV Drawings for Dante's Inferno, in which he introduced a transfer process to his practice of combining found objects and photographic imagery. Art lecturer Ed Krcma spent years identifying the images Rauschenberg used and elucidates his findings in Rauschenberg / Dante: Drawing a Modern Inferno (Yale University Press, May 16, 2017). The 208-page book features 80 color and 38 black-and-white illustrations. 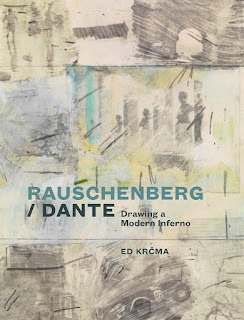 Also see Robert Rauschenberg: Thirty-Four Drawings for Dante's Inferno (The Museum of Modern Art, June 27, 2017), featuring an Introduction by Leah Dickerman and poetry commissioned from Kevin Young and Robin Coste Lewis, published in conjunction with "Robert Rauschenberg: Among Friends", a major 2017 retrospective at the MoMA in New York City. The exhibition continues through September 17. ✦ Today, The Art Assignment brings us Odili Donald Odita, who talks about his work and presents an assignment about color. ✭ The Shoshana Wayne Gallery, Santa Monica, California, is featuring in her second solo exhibition at the gallery the work of Sabrina Gschwandtner of Los Angeles. 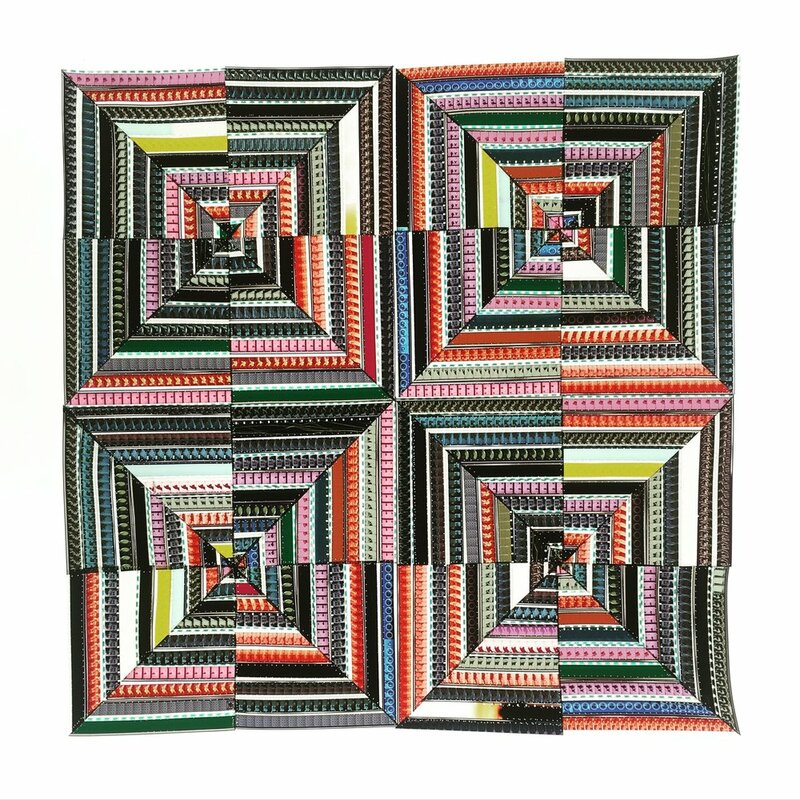 On view through July 15 is "Sabrina Gschwandtner: Hands at Work"; comprising a video and 11 "quilts" constructed from deaccessioned 16mm film and presented in lightboxes, the exhibition is a study of hands, craft, and montage. The footage selected shows hands physically at work — weaving, knitting, sewing, dyeing cloth, tying string, spinning yarn, and feeding fabric into machines — and examines the concepts of craft and art as practiced by women. Read Andrew Lampert's interview with Gschwandtner at BOMB (2013) in which the artist discusses editing, deterioration, and "women's work" in her film quilt series. ✭ In Oregon, Portland Art Museum continues through October 29 "CCNA: Connecting Lines", an exhibition of work by Brenda Mallory and Luzene Hill, both of whom are Native Americans. Hill's work takes as its subjects violence against Native women, female empowerment, and Native sovereignty. Mallory is showing her installation Recurring Chapters in the Book of Inevitable Outcomes, which she created during her 2015 Eiteljorg Contemporary Art Fellowship. Each of the artists discusses her work in her respective short below. Read an essay for the exhibition and exhibition texts that describe the Mallory and Hill artworks. ✭ North Alabama's Huntsville Museum of Art is displaying through August 6 the botanical paintings of Charles E. Burchfield (1893-1967). 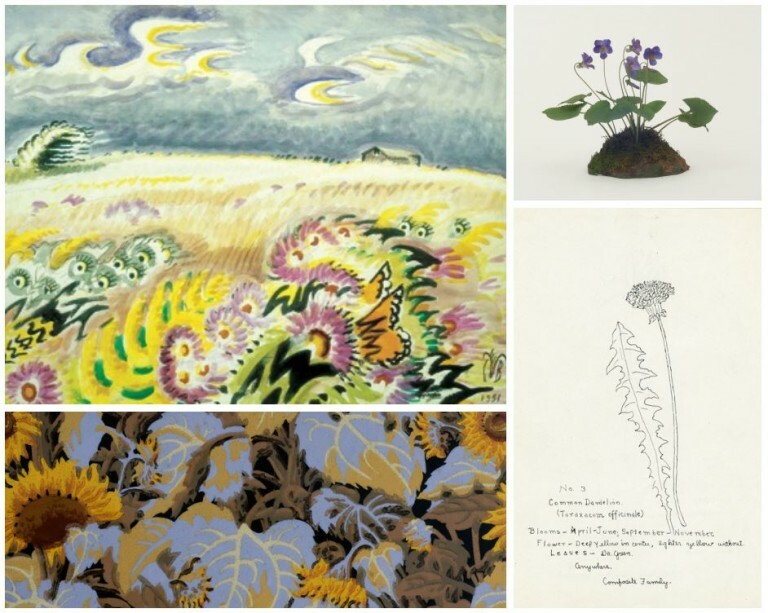 The exhibition, "Burchfield Botanicals", features a selection of Burchfield's masterworks as paired with his early botanical sketches and watercolors, as well as objects from the Marchand Wildflower Collection, Buffalo Museum of Science, New York. 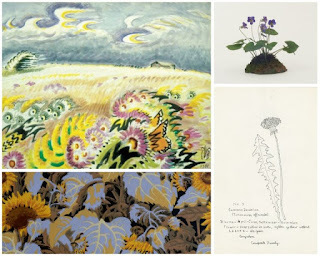 Between 1908 and 1911, Burchfield created almost 500 sketches of wildflowers and plants found in the forests and fields near his childhood home in Salem, Ohio. Read more exhibition information and see additional images in this pdf flipbook on spring and summer shows. ✭ Currently on view at the Taft Museum of Art, Cincinnati, Ohio, are 50 paintings spanning six centuries of British painting. The exhibition, "Treasures of British Painting 1400-2000: The Berger Collection", includes work by Anthony van Dyck (1599-1641), Benjamin West (1738-1820), Thomas Gainsborough (1727-1788), John Constable (1776-1837), and John Singer Sargent (1856-1925). The show continues through October 1. ✭ In "From These Woods", on view through September 1 at the Moss Arts Center at Virginia Tech, Blacksburg, Virginia, you'll find examples of woodturning, carving, basketry, and furniture making hand-crafted by highly skilled artists from the Appalachian region. Among the artists represented in the show are Bill and Corinne Graefe of Phoenix Hardwoods, Floyd, Virginia; Alex Bannan, Roanoke, Virginia; Jennifer Zurick, Berea, Kentucky, and Norm Sartorius, Parkersburg, West Virginia. 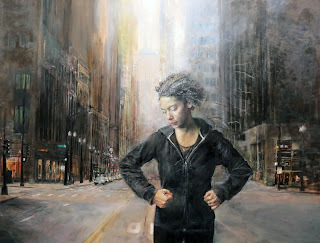 I am so pleased today to introduce my blog readers to the art of painter Judith Peck. Please see my new Artist Watch feature at the online arts magazine Escape Into Life. 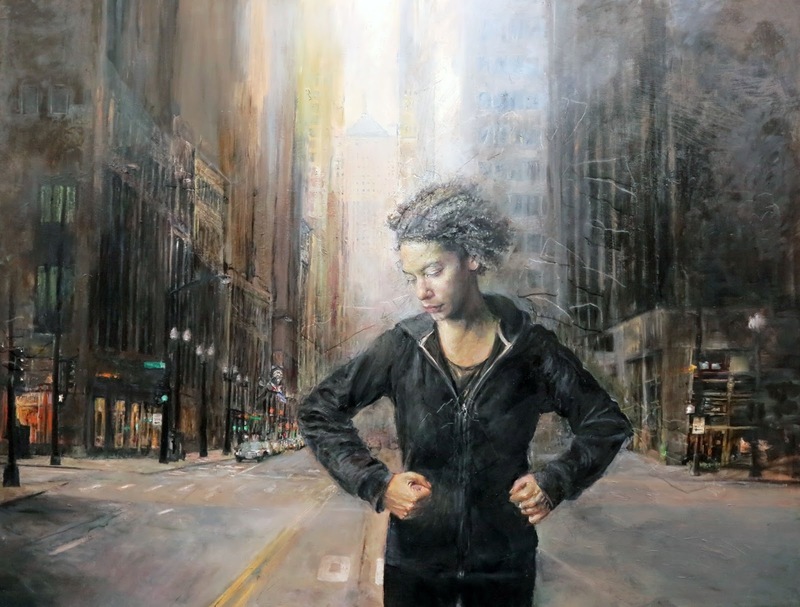 A Washington, D.C.-area allegorical figurative artist, Judith is an award-winning painter whose work is exhibited throughout the United States and collected worldwide. You will find in my Artist Watch column eight images of oil paintings from Judith's current, in-progress series, Judith's Artist Statement, and a brief biography. British artist Mark Leckey is multidisciplinary; his work includes installations, prints, and sculptures, as well as video, performance, and sound works. He is especially concerned with technology's effects on popular culture and is drawn to explorations of the imagination and ideas of desire and transformation. In the Louisiana Channel interview below, Leckey, interviewed in May 2017, discusses his installation He Thrusts his Fists against the Posts but Still Insists he Sees the Ghosts, which was inspired by his arwork Dream English Kid 1964-1999 AD (2015). As Leckey explains, the installation is a kind of visual and audible memoir, replicating the ramps beneath the M53 motorway in Ellesmere Port where, as a youth in the 1970s, Leckey used to meet with friends. The installation can be seen and experienced through September 3 at the National Gallery of Denmark. The London-based Leckey is a recipient of the Turner Prize (2008). MoMA PS1 presented "Mark Leckey: Containers and Their Drivers", October 23, 2016 - March 5, 2017, the first comprehensive U.S. survey of the artist and the largest exhibition of his work at the time. Filmmaker Marc Burnett animated "Words When Bored", a poem by Bob Holman, featured below. Creative consultant to Alonzo King's LINES Ballet* company, founder of the Bowery Poetry Club, and co-founder and co-director of the Endangered Language Alliance, Holman has published some 16 poetry collections, including, most recently, Sing This One Back to Me (Coffee House Press, 2013). His poems also are featured in A Couple of Ways of Doing Something: Photographs by Chuck Close (Aperture, 2006). Currently, Holman is a visiting lecturer at Princeton University's Lewis Center for the Arts. * This past May, LINES performed Figures of Speech, a production inspired by endangered languages.